It’s said that you’re supposed to give your baby follow-on milk from six months, around the time that you start weaning them. But in the past few weeks, Emily has just not been satisfied with the formula that she has had since birth. 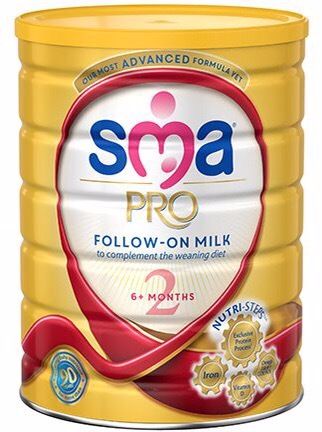 Since I gave up breastfeeding, a week after Emily was born, and a failed attempt with Aptamil, I tried Emily on SMA’s Comfort milk, which she happily drank, up to 3 weeks ago. At the moment Emily has a bowl of baby porridge at 9.30 in the morning and a bowl of pureed vegetables in the afternoon for lunch. It seems that her being on her comfort milk wasn’t doing anything to please her appetite. So I made the decision to put her on follow-on milk at 5 months. And it’s been going really well, too well. We have gone through about 2 tubs a week. Which works out to about £20 a week, which may seem like a lot, but she doesn’t drink as much formula by itself, like she used to. She gets everything she needs from her meal when she has it. In the morning when she wakes up, she’ll have a bottle of formula, about 3 hours later, she’ll have a bowl of her porridge. This will generally fill her up till about 1 o’clock in the afternoon. Sometimes if she’s particularly hungry, she may have a small bottle of formula around 11 AM. In a 24hr period, Emily will have 5 bottles of formula. Throughout the day she’ll nibble of pieces of fruit or have her fruit purée. Currently anything with banana and strawberry seems to beer favourite. There are a lot of parents who disagree with follow-on milk. Some say it’s a marketing ploy by brands for us parents to spend more money, insisting that their baby should stick to the normal formula that they have had since birth. As it has been said so many times before, you know your own baby better than anyone else. And for me seeing Emily not getting what she needs from her formula, I knew it was the right decision to try something different and so far so good. Now that Emily is six months old, it is vital that she gets more iron in her diet. This will mean as I continue to wean her, I will add iron rich foods and other nutrients into her diet, so that she receives all the vitamins that she needs.